Kim's Kitchen Sink: Happy Spring! It's the first day of Spring, and I welcome this, my favorite season, with open arms! 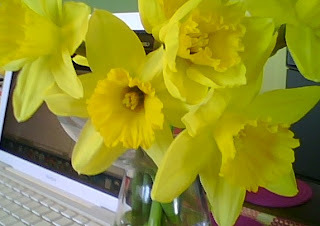 Google is celebrating with a tribute to one of my favorite books, and I celebrated by purchasing 10 daffodils yesterday at Trader Joe's ($1.29!) They come as buds, and overnight they blossomed into the beautiful and cheery flowers shown below. Hooray! Happy Spring! It snowed in New York this morning. DH called me to tell me to look at Google - I love Eric Carle! I used to be able to recite Saturday's munchies by heart!